Sinclair Athletics announced April 11 the selection of Amanda Schroeder (6-00/FR – Carroll H.S.) to the NJCAA Division II 1st Team All-American list for 2017-18. The Sinclair Women’s Basketball team (27-4) finished the 2017-18 campaign one game away from advancing to the NJCAA Division II Sweet 16. Schroeder was an integral part of the Sinclair successful journey through the regular season as Co-Champions of the OCCAC that include a number of weeks being ranked in the Top 20 nationally. The announcement of Schroeder being named 1st Team All-American capped off an outstanding freshman year that included OCCAC Player of the Year, OCCAC Freshman of the Year, NJCAA District I Player of the Year, NJCAA All-Region XII 1st Team, as well as earning OCCAC Player of the week honors 5 different weeks. In 31 games, she set a school record for total points scored in a single season (807) and points per game average (26.03). 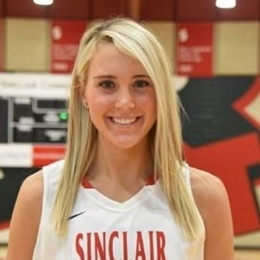 Schroeder finished the season with an 89.1% free throw percentage for a single season a Sinclair record to go along with scoring 30 points or more 10 times, which is both a single season and career school record.